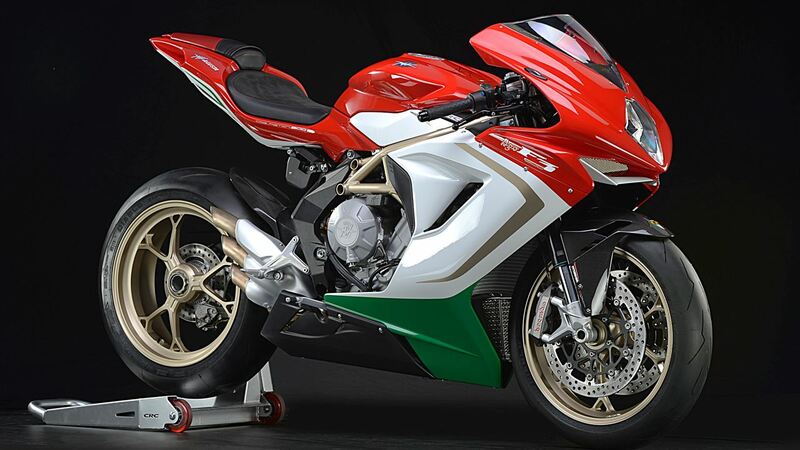 Technology, perfectionism and excellence have always been the driving factors for MV Agusta. 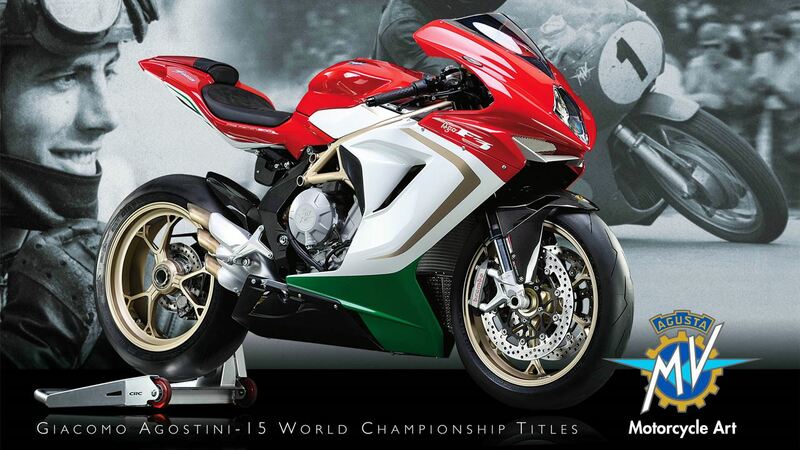 The tricolour, gold and that Number 1: the fairing of the championship, evoke the exhilarating world of racing and the atmosphere of the tracks where the legend of the unbeatable MV Agusta Grand Prix bikes were born. These bikes made Giacomo Agostini a motorcycling legend and have now re-emerged from the past thanks to the most faithful replica ever: the F3 800 AGO, packed with unsurpassed technology that provides jaw-dropping performance and unparalleled riding pleasure. Electronically controlled engine and traction control play a pivotal role, ensuring the F3 800 AGO delivers tip-top performance at all times. Practical handlebar controls let the rider choose from among three different pre-set power delivery modes. And those hungry for more personalised performance will be delighted to hear that the F3 800 AGO allows configuration of the control parameters, including the traction control settings (8 levels, disengageable). Thanks to the MVICS (Motor & Vehicle Integrated Control System), the rider has absolute control over the set-up process and can thus truly benefit from the exceptional versatility that brings out the technical qualities of the bike whatever the riding conditions, on the road and racetrack alike. Like a real racing bike, the F3 800 AGO even lets the rider choose – together with a host of other parameters – the ratio between throttle twist and throttle body opening. Performance and safety go hand-in-hand even on the racetrack, which is why the F3 800 AGO features the sophisticated ABS Bosch 9MP with Race Mode and the RLM system, which prevents the rear wheel from lifting off the asphalt under hard braking. Awesome deceleration is ensured by a top-notch braking system, which features two 320 mm front discs, radially mounted Brembo monobloc 4-piston calipers and a 220 mm rear disc. The light, compact ABS system prevents any unwanted and potentially dangerous wheel lock while simultaneously ensuring the shortest possible braking distances under critical riding conditions (e.g. hard braking in the wet). Perfection is hidden in every detail: the alloy foot pegs, machined from solid aluminium, and other aluminium items make the F3 800 AGO a stunning example of function-focused exclusivity. Every single component is carefully designed to make this MV Agusta even harder-hitting, faster and more sensational on road and track than ever. The use of carbon fibre on the front and rear fenders gives the F3 800 AGO real racing panache, making the bike even lighter and enhancing the already excellent power-to-weight ratio. Another key contribution comes from the gorgeous forged rims, which save a full 2 kilograms compared to the standard version. A sports-style plate holder emphasizes the flowing lines of the tail, underlining its thoroughbred racing pedigree. The F3 800 AGO is unique in every detail. A silver plaque attached to the steering yoke shows a progressive number certifying that the F3 800 AGO is one of MV Agusta’s most exclusive creations. Only a limited edition of 300 such bikes will be manufactured and on each one the fuel tank will carry the personal autograph of 15-times world champion Giacomo Agostini. A tangible thrill, then, for MV Agusta devotees and fans of the world’s greatest-ever motorcyclist, to be experienced, quite literally, every time they sit astride the bike. Lastly, each of these incomparable bikes will be delivered together with a special certificate signed by Giacomo Agostini himself, providing additional proof of the uniqueness and originality of this latest MV Agusta legend. The F3 800 AGO will go on sale from the beginning of May 2014 at a price of 23,990â‚¬.